From the first time we heard this song written by Matt Merker, we felt it was a unique jewel that would be a comfort and encouragement to God’s people as we live out faith in these difficult times, whether in suffering, persecution or death. It reminded us of the Spirituals and also of the hymn, “We Rest on Thee” (which inspired the missionary Jim Elliot and the title of his biography, “Through Gates of Splendor”). Interestingly, the Finish melody, “Finlandia,” is also the melodic basis of the hymn, “Be Still My Soul,” that was the favorite hymn of Eric Liddell, famous Olympic gold medalist who retired early from Sport to return to China, home of his birth, and serve as missionary. 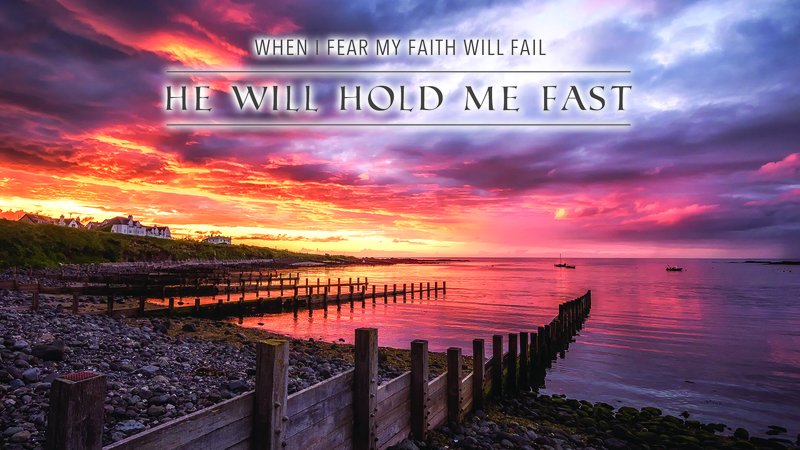 A member of our church had sent the original words to “He Will Hold Me Fast” to me and our senior pastor, suggesting that this could be a good song for us to learn as a church. I forgot about the song for a while, but later pulled it out again when I was walking through a difficult personal season of doubt and uncertainty. I was wrestling with the hard questions of the faith and struggling to place my trust in the enduring power of God’s preserving grace. John Piper’s sermon from T4G 2012 on Jude vv. 20-25 was a lifeline for me, and Jude 24 became an anchor for my soul in that trying time: “Now to him who is able to keep you from stumbling and present you blameless before the presence of his glory with great joy...” It was at this time that I was beginning to try my hand at writing new tunes for old texts, mainly as a personal devotional exercise to help aid my own soul in seeking Christ. I pulled out “He Will Hold Me Fast” again and the words ministered to me deeply. I wanted to see the resurrection and return of Christ featured in the lyrics, since our hope is guaranteed by the reality that Christ has risen and is coming again.